WASHINGTON -- During his years in hiding, Osama bin Laden urged followers to concentrate on attacking Americans and wrote bittersweet letters to one of his wives and his children, according to documents released Wednesday by U.S. intelligence officials. The documents were seized in the al-Qaida leader's compound during the raid in which bin Laden was killed. More than 100 were declassified and published. The documents include a fill-in-the-blanks job application for terrorist candidates that ranges from typical questions about education and hobbies to "Do you wish to execute a suicide operation?" Altogether, the 103 papers and videos add new texture to the world's picture of the mastermind of the Sept. 11 terror attacks, much of it in his own words. They include videos and images of letters in Arabic, with the English translations by intelligence officials. The material was recovered in the May 2011 raid on bin Laden's compound in Abbottabad, Pakistan, the Office of the Director of National Intelligence said. It said it was being made public after a rigorous review by government agencies, as required by a 2014 law. U.S. officials had said at the time of his death that they believed bin Laden had become so isolated in his hideout that he no longer exercised the level of control over al-Qaida operations that he had in the past. In one letter, bin Laden urges one of his deputies to inform "our brothers" they must keep their focus on fighting Americans. Their "job is to uproot the obnoxious tree by concentrating on its American trunk, and to avoid being occupied with the local security forces," bin Laden writes. Another bin Laden letter mocks President George W. Bush's "war on terror," saying it had not achieved stability in Iraq or Afghanistan and questioning why U.S. troops were "searching for the lost phantom" - weapons of mass destruction in Iraq. No date is included on the U.S. translation. In a video letter to one of his wives, also described as bin Laden's "last will," he says, "Know that you do fill my heart with love, beautiful memories, and your longsuffering of tense situations in order to appease me and be kind to me." Among the documents is an al-Qaida job application that begins with the mundane, asking applicants to "please write clearly and legibly." 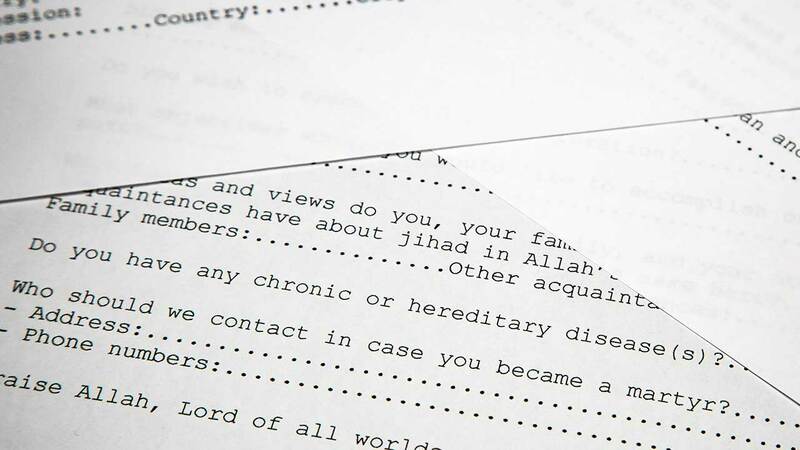 It asks conventional questions, such as has the applicant ever been convicted of a crime, before veering into more chilling territory, including: "What objectives would you like to accomplish on your jihad path?" It then asks whether the applicant wishes to execute a suicide mission. It ends: "Who should we contact in case you become a martyr?"